Harry Morris is among several returning players from the gold medal winning 2015 squad. 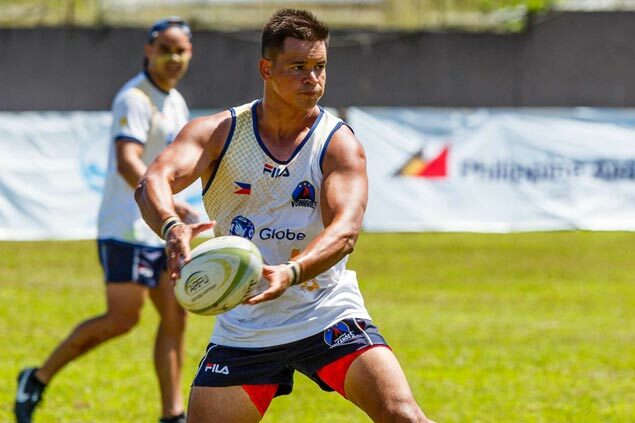 JAKE Letts, Harry Dionson Morris, Patrice Ortiz Olivier and Justin Villazor Coveney head the 19-man national rugby sevens training pool for the Southeast Asian Games in August. The Volcanoes are expected to face tough challenges from teams from Malaysia, Thailand and Singapore with the unavailability of key personnel from their dominant 2015 Gold Medal team. Matthew Saunders and Alex Aronson will not be able to rejoin the squad but the pool has Andrew Pagalilauan Ramsden, Andrew Penaflorida Wolff, Chris Alamil Everingham, Christopher Baltazar Hitch, Edlen Cortez Hernandez, Gareth Dela Rosa Holgate, Harrison Carcellor Blake and Jason Celada Lynch. Also in the pool are Jay Volney Ricafort Rouse, Jonel Olayres Madrona, Joshua Golimlim Aragon, Lito Ramirez, Ricky Alarcon Kucia, Rupert Dian Zappia and Vincent Amar Young. The final 12 man roster for Team Philippines will be announced the week of August 14 after the official SEAG training camp. The team will be handled by coaches Frano Botica and David Johnston. "Malaysia will most likely be our toughest competition, however in Rugby 7s any team on their day can win. Singapore and Thailand have also shown that in past tournaments,”said Philippine Rugby Football Union managing director Matt Cullen. “It’s going to be a tightly contested tournament. It will be a test for the Philippines as always however the Volcanoes never back down from a challenge, we have the squad to go back-to-back gold medals.” Cullen added. The Globe Volcanoes are coming off two highs, a bronze at the SEA 7s in April and a gold medal finish in the Asia Trophy Series in February. The women’s pool, meanwhile, has 23 players. Bronze medalists in the Singapore SEA Games two years ago, the squad now named Transcom Lady Volcanoes looks to finish in the top two in Kuala Lumpur. The training squad has Katrina Andrews, Tanya Bird, Hayes Monica Bolofer, Genieli Dela Cruz, Rosemarie Dela Cruz, Gelanie Gamba, Marie Antonette Gambito, Kaye Llanie Honoras, Jheewel Idea and Helena Roxanne Indigne. Also in the pool are Eloisa Jasmine Jordan, Jerusaleen De La Torre Manodon, Camilla Maryam Maslo, Ada Milby, Aiumi Ono, Anna Beatrix Pacis, Astrid Tamika Louise Sadaya, Rassiel Sales, Madille Salinas, Angella Camille San Juan, Sylvia Tudoc, Mae Ann Ubaub and Dixie Star Yu. The women’s team coach is Shirley Russell with Ai Den Ng as assistant. “The SEA Games is always an event we aspire to do well in, it was our silver medal back in 2007 that launched rugby in the Philippines. Since then, our game grew dramatically thanks to the PSC,” said Cullen.